"I hate rude behavior in a man, I won't tolerate it." Lonesome Dove is a star-studded miniseries, which tells the sweeping tale of two seemingly old, washed up Texas Rangers who take to the cattle trail after ten years of sedentary ranching outside a fictional sleepy Texas border town from which the series takes its name. Robert Duvall, in perhaps his finest performance, portrays August "Gus" McRae, who is more concerned with whoring and drinking whiskey than taking care of the cattle—or anything else for that matter. On the other hand is Captain Woodrow F. Call (Tommy Lee Jones) with little humor and even less patience for lazy workers than lawlessness. But it is the third of the trio, the irascible, gambling and whoring Jake Spoon (Robert Urich), who urges his friends to attempt the cattle drive—because he is on the lam, dodging a murder charge. Ironically, it is Call who is taken over by the vision to drive their entire herd 2,500 miles north through the toughest terrain and Indian laden land leading to Montana. Despite reservations, Gus, the more practical of the two, begrudgingly agrees to help his longtime friend and partner, Call, attempt his vision to be the first man to raise cattle in Montana. So begins the journey of the men of the Hat Creek Cattle Company, including a young orphan growing up under their collective supervision, Newt Dobbs (Ricky Schroeder). Based on the book by Larry McMurtry, who considers this a tale of friendship, the story centers around the archetypical prototypes of the visionary and the practical companion, ala Don Quixote and Sancho Panza. 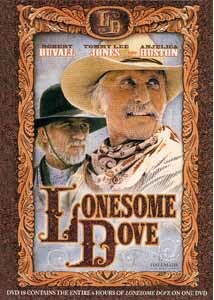 But this story cannot be told with these characters alone, and Lonesome Dove boasts an all-star cast. Despite this, Lonesome Dove is neither full of pretention nor glamorized in any way. Most of these actors were just starting out when this was filmed, including Steve Buscemi, D.B. Sweeney, Danny Glover and Tommy Lee Jones. This is a fine ensemble cast bringing to life the reality of the Eighteen hundreds in the unsettled West. These are the real men, the cowboys, the pioneers, faced hardships untellable. This is not a politically correct tale accessible to the whole family, as it is filled with adult themes, anti-Native American rhetoric and worse. But it is a tale of friendship and espouses the ideal that one should follow their dream through all obstacles. Before the novel came out in June 1985, through a common friend McMurtry met and hit it off with TV movie-of-the-week and specials producer, Suzanne de Passe. Discovering he had a book going into print, Passe requested a copy via McMurtry's agent, Irving "Swifty" Lazar. What came instead was a flatbed cart of boxes filled with Lonesome Dove's galleys! Not even halfway through, Passe purchased an 18-month option, not knowing that the book had already been shopped around and denied by every studio and television station. Both Bogdonavich and John Huston (Maltese Falcon, African Queen) tried to convince Passe to make a 2 hour film. But faithful to the vision of the book, she was convinced the film could not be made in under six hours. Passe and McMurtry decided a miniseries was the only way to fulfill the vision. By that time, McMurtry needed to move on and chose not to pen the screenplay. Bill Wittliff ended up not only writing the faithful adaptation but also co-executive producing. A year had passed from the option purchase and nothing was happening when Lonesome Dove won the Pulitzer prize for fiction; its fortunes began to turn. Even though westerns were not popular in 1986, and 6 hour miniseries even less so, CBS not only committed to it in one meeting ($16 million), but after seeing just the first 4 hours of Wittliff's script, did the unthinkable—extended the series to eight hours (4 nights). The post-production completed 10 days before it was to air on Sunday, February 4th, 1989. A 23 share would have made the program an overwhelming success; it pulled in a 26.5 rating and 38 share!! Image Transfer Review: This is a mixed transfer. The Color is fairly washed out for the first 20 minutes, otherwise the color is nicely rendered without bleeding. The black levels are high, and no pluming whites or wash outs could be found. The third part is the worst of the four; scan lines are evident, evidence of dot crawl, and dirt. Otherwise I was pretty pleased with the overall quality, considering the source probably isn't high def. Audio Transfer Review: Well, you really can't expect much from a mono mix. The dialogue is mostly well rendered and understandable, but I did find myself turning it up at the beginning to hear what they were saying. It would have been nice to have a better mix, but this is such a riveting film you begin to immerse in the story and forget the faults of the audio track. The soundtrack is wonderful, and deserves a more full realization. Extras Review: I hate the user unfriendly Q&A format, and thought the studios had dropped that after early criticism some two years ago. The audio is atrocious based on the poor acoustics of McMurtry's bookstore and a baby crying in the background. The faux interview was still interesting for tidbits of information (he does little research, characters are fake, etc.) The interview does hold the secret as to which character McMurtry thinks is the "lonesome dove" (although there are many). We also learn that the predecessor to Lonesome Dove was originally written in the 1970s, and McMurtry might have abandoned the story (it was never produced—lucky us) had he not, years later, seen that Lonesome Dove Church bus. Discovering the title gave impetus to the story being written. Perhaps they chopped this interview (and most of the interviewer) out because she practically drools on McMurtry in affirmation of his every thought, and became tedious. 13 questions. On the other hand, because most of her answers are longer (and then some! ), Suzanne de Passe illuminates the viewer on the behind-the-scenes making-of Lonesome Dove from beginning to end, as described above. 15 questions. Again, I'm glad to receive the information, but the awkward retrieval set up is near nerve damaging. Not remembering the adult themes (I think "whore" is said every two seconds, and "poke" every 10th), I watched this with my step-daughter-to-be. I wasn't sure she'd make it though the dialogue-intense first half-hour, but she did, and she LOVED all 6 hours (in one sitting, mind you) of this tremendous, life-affirming miniseries. May Gus ride on forever chasing buffalo in that great cowpatch in the sky!